Before known as the ICDE Presidents’ Summit, now known as the ICDE Leadership Summit. ICDE invited for many types of leaders in education, particularly those who have an interest in learning and teaching in the digital age and learning analytics. 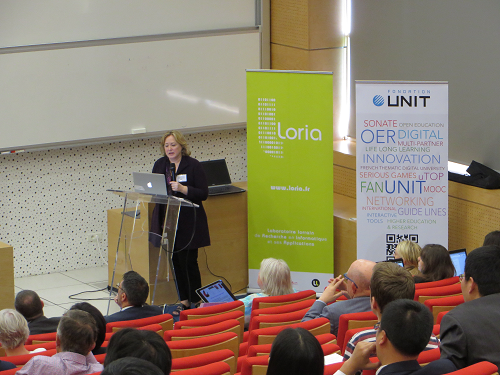 The 2017 ICDE Leadership Summit hosted by LORIA at Université de Lorraine, was held 22-23May 2017 in Nancy, France. It was organised back to back with a one day Forum “Visionary Leadership for Digital Transformation”, taking place the day after the Summit at the UNESCO Head Quarters in Paris, organised by ICDE, UNESCO and the project D-Transform. These two combined events offered a rare opportunity to explore in depth the strategic main issues for higher education leaders setting course for quality teaching and learning in a time of digitalisation. See the full conference website here. Read about the main lessons learned from the very engaged presentations and discussions on the potential that learning analytics holds for quality enhancement. Read more here. Read about the highlights from the the summit here. View a selection of videos from the presenters here. View the speakers bio list here. A number of speakers from the 2017 ICDE Leadership Summit provided short opinion pieces based around the presentation/ panel discussion they were foreseen to be involved in prior to the start of the summit. The opinion pieces were short articles that were prepared for delegates of the summit as a teaser for what they can expect on the day. All opinion pieces can be accessed here. M. Brown (Dublin City University) Accompanying video clip. Speakers at the Leadership Summit have been invited to provide a short opinion piece based around the presentation/ panel discussion they are foreseen to be involved in. The opinion pieces are short articles that have been prepared for delegates of the summit as a teaser for what they can expect on the day. Learning Analytics: What is it for? Learning analytics is the use of data about learners and their contexts to understand and optimise learning and the environments in which it takes place. It involves measuring, collecting, analysing, and visualising the data about learners and learning for various stakeholders. This brief opinion paper raises a number of conceptual and methodological issues associated with attempts to evaluate institutional initiatives in the area of learning analytics. It frames the discussion around three recent works that invite a more critical reading of learning analytics research and the potential of interventions and data-driven decisions for successful, sustainable and scalable impact on an institution-wide basis. Ethical and Legal Issues of Learning Analytics: Do we need a global framework? Data analytics is the 21st Century Orwellian “Big Brother” . Every single one of us, to a greater or lesser extent, is living what I would like to call an “e-life” - a life that is shaped and influenced by the digitised world in which we live and move and have our being. From the moment of conception, to the moment of death (and even post mortem!) we generate a digital footprint, and leave a digital legacy that will never be eradicated, and that comprises a huge variety of data that is continuously stored, harnessed and used, in conjunction with increasingly sophisticated technology and capacity to monitor, measure, assess, (mis)inform, persuade, manipulate and entice or encourage us into decisions and behaviours, which have as their ultimate goal, control for financial efficiency or gain. The Open University of Israel (OUI) is the largest university in Israel enrolling in 2016/17 about 46,200 students. Since it exercises an open admission policy, the attrition rate of students is quite high, particularly in the first courses, ranging between 40% to 50%. Ongoing evaluations and analyses of student dropout patterns have highlighted the fact that many novice adult students (the average age at the first degree level is 30.8) lack basic study skills and writing skills. In an attempt to decrease student attrition rate the Support Division of the OUI provides a variety of tutor/counselor interventions and support mechanisms. The institutional analytics journey at the Singapore University of Social Sciences (SUSS) can be considered a fairly recent one. For several years, learning analytics projects in the University (e.g., Enrolment and Early Predictors of Academic Performance and An Exploratory Study of [SUSS] Associates [i.e., part-time instructors] – Establishing Baseline Knowledge) were undertaken as institutional research projects, overseen by the President’s Office. This approach was changed on 1 August 2016 when institutional analytics became an important dimension of the University’s strategic thrust with the establishment of the Institutional Research & Analytics Unit (IRAU). Faced with the need for evidence informed decision making, University leaders have begun the lengthy journey of understanding and utilizing the robust data that surrounds our Universities.As a collective, we continue to utilize and build first generation learner analytic systems in which historical, and often institution specific, data is amassed and analyzed using a retrospective lens to understand trends in learner activity and behavior. Despite the limited prescriptive ability of this small and non-comparable data set, University and Government policy alike continues to drive resources toward understanding the behavior of our past learners in an effort to understand our future learners. For more information on the conference, the programme and the list of speakers visit the dedicated summit website here.